MACC is headquartered in Richmond, Virginia, but we serve clients throughout Virginia, Maryland, Washington D.C., North Carolina, West Virginia, Delaware, and beyond. We provide building automation systems and services to a variety of commercial, industrial, government, military, municipal, and university facilities. 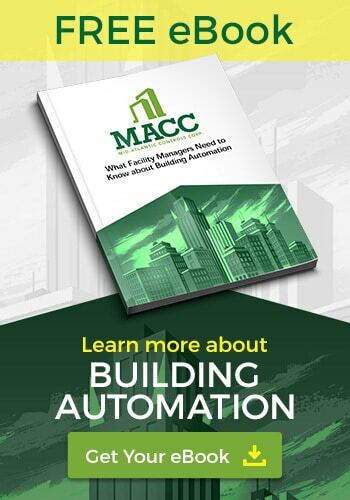 Learn more about building automation systems and get an estimate for your building or project. 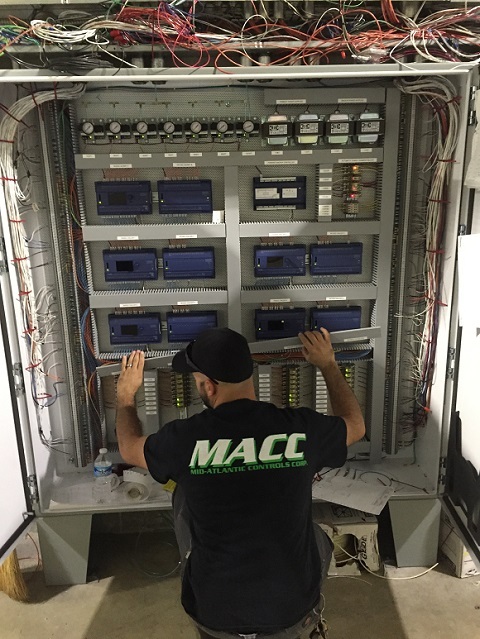 MACC gives you greater control over your facility by helping optimize equipment, create system efficiencies, and reduce your operating costs. The goal of our maintenance program is to help extend the life of your building automation equipment, maximize ROI, and help reduce future maintenance costs. In addition, our trained and knowledgeable staff can help identify inefficiencies in your building and identify energy-saving opportunities. Many owners are often faced with the decision to upgrade or replace aging building automation equipment as technology improves and operational needs change. This is especially true for older BAS systems that are being outpaced by current technology. Luckily, we have experience with almost every building automation system that has been installed in the past 30 years. This allows us to provide a less resistant migration path for clients and salvage much of their initial BAS investment. Decreasing operating energy costs of a facility while improving the operational efficiency of the equipment is becoming a bigger and more costly challenge for many organizations. Through various techniques and services, MACC can help companies save energy and improve indoor environments. Gathering building data is easy if you have the right systems in place; however, putting that data to use can often be a challenge, especially if you’re managing a large facility or several buildings. MACC’s Data Visualization programs create real-time reports that are easy to understand and allow fast, strategic decision making. Our mission is to provide non-proprietary, open systems to our customers. We want to be a turnkey controls system contractor that self-performs every aspect of the project from installation to ongoing maintenance. As an independent contractor, we provide solutions from a variety of Building Automation System manufacturers. Our capabilities include servicing and expanding systems installed by other contractors. Furthermore, our track record of on-time quality controlled installations is unrivaled by others and reflects our commitment to clients. Can A Trane System Be Updated To Tridium? How Much Does Building Automation Cost? If you are a facility manager, contractor, or building owner in Martinsville that’s interested in making your building the best that it can be, we’re here to help. Contact MACC to start saving money, energy, and streamlining your building management. Below are some of the systems we work with. If you do not see your system listed or have older BAS equipment, contact us to determine if we can help.